Quick and easy remote access to Windows®, Mac OS® X, and Linux® computers. Remotely support attended and unattended computers inside the LAN. Reboot crashed computers and wake sleeping computers remotely. Remotely control Windows, Linux, and Mac OS X computers, laptops, and servers from a single console. Remotely connect to out-of-band computers with Intel® vPro™ with AMT, Wake-on LAN, and KVM support. When data security or compliance is on the line, your remote support tool shouldn’t present any vulnerabilities. Enforce two-factor authentication in security-sensitive environments using Smart Card logon and authentication. Security threats come in all shapes and sizes, externally and within your own ranks. 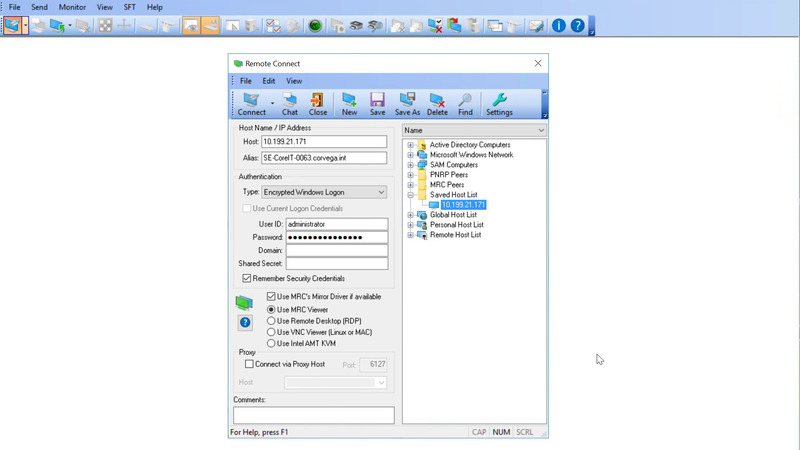 Set permissions for accessing remote computers based on user roles, or use Active Directory® integration in centralized mode. The faster you can connect to an end-user’s machine, the faster you can resolve his issue. Easily create and deploy custom MSI packages for the installation of the MRC Client Agent Service. Your business doesn’t operate in a vacuum. Neither should you. Use remote session tools, including chat, messenger, screenshot capture, file transfer, and more. Dameware Mini Remote Control is an industry favorite. Hands down. Where can I find information on installation and customization for my Dameware Mini product? Does SolarWinds offer training or certification for the Dameware Mini product? Our New to Dameware section was created using customer feedback and contains videos, guides, and articles that will help you be more successful with your installation and customization. Remote control software, sometimes referred to as remote desktop software or remote access software, enables IT support technicians to connect and control remote computers to enable IT administration, support, and troubleshooting.